Ronald McDonald House Charities of Huntington, Inc.
Ronald McDonald House is a home-away-from-home for families who must travel hundreds, sometimes thousands, of miles outside of their own community to seek medical treatment for a child. 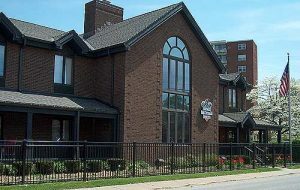 Ronald McDonald Houses are located near hospitals that provide specialized care for children. Twenty-four hours a day, 365 days a year, each House offers parents and family members of seriously ill children a refuge from the hospital – a room of their own with a comfortable bed, kitchen and laundry facilities, and toys for the kids. Families who stay at the House find other families with the same concerns, and staff and volunteers who listen and care. Houses are designed to encourage interaction among their guests to help them cope during an extremely difficult time. Ronald McDonald Houses offer all of this to families for only a small contribution; if that is not possible, no one is turned away. The first House was built in Philadelphia in 1974, inspired by a young leukemia patient whose parents decided there had to be an alternative to lonely, anxious nights in hospital waiting rooms far from home. Since then, Ronald McDonald Houses have served more than 4.5 million family members in more than a dozen countries.